I measured, I gridded out, then created a floor plan for my new bathroom. The plan was not much different than how it looks now except of course everything will be brand new and modern. I then went to the various supply businesses and picked out tile, paint, a vanity and pulled my vision together. Wow, that was easier than I thought it would be. I had emailed him my floor plan and some pictures of bathrooms in the colour palette I wanted with elements I wanted included in my new bathroom. He was underwhelmed. Sure he had valid points and was only out for my best interests but when I got off the phone, all my enthusiasm and confidence for my bathroom plan had vanished. I began to second guess myself. I had been so certain of my plan. I was confident in my choices but now I wasn’t so sure. My builder’s good intentions had infected me with indecision. Making decisions and sticking with them especially if they involved choices that you will live with for a long time can be daunting. A bad hair style, your turn at picking the Friday night movie rental, even an impulse vacation destination, those could be bad decisions but are quickly rectified or soon forgotten but in the case of decorating your home, a poor choice is something that will flaunt itself everyday of your life for years to come. I went over the floor plan again. I reworked my design, re-examined my wants and needs and still came up with the same outcome yet I was battling this plague ravishing my judgement. What was the real issue here? First, I have said it before but it bears to be repeated. I am a people pleaser. It is an addiction. I am aware of this and I am working hard to overcome this affliction. Questioning my design choices for the bathroom renovation has nothing to do with whether they are good or bad because they are exactly what I want, so for me, my lifestyle, and my families lifestyle they are perfectly good choices. They have been well thought out, fit within the space, are within my budget and I will enjoy the results and be happy with the results for years to come. It is my need to please another person, and in this case my builder that has me questioning my choices. Being decisive in life requires understanding yourself. When you establish an internal inventory of your own personality traits, your likes and dislikes, the sureness of your decisions increases and you are able to withstand criticism from others about your choices. Sounds so simple really, I like this and I really don’t care what you think about it. Now think about the many times another person has swayed you to their way of thinking. Peer pressure, “Come on everybody who is anybody is going” professional advice, “In my opinion, that is not a current colour being used today” even guilt, “go ahead with out me, I’ll just stay home by myself, all alone”, all of these insidious technics are designed to question your decision and change your mind. In my case, I have had enough time to rethink my renovation decisions and re-commit to my original plan but reflection is not always possible. If you follow any persons life story who is successful or achieved greatness you will find that they had mastered the art of being decisive. It starts out as a conscience commitment to a choice. The artist who dedicates himself to his art form no matter if his work is excepted by the masses or not, the athlete’s determination to be successful in the face of adversity or the inventor who fails over and over as he perfects his idea. The common denominator for their success is that they made a conscience decision based on their authentic self’s wants and needs, some would call it their passion, and stuck with it. When we value our own opinion more than that of another’s, then we can make decisive decisions. There is always the opportunity to change your mind on a decision. New information comes to light, lifestyles change, people change, but you are still acting decisively if you make your new decision based on you own opinion or gut feel of the situation. I’ve always liked the decision filter of asking yourself if this will matter to you in a day, a week, a month, a year. This is a good gauge of how deeply the result of your choice will affect your life. 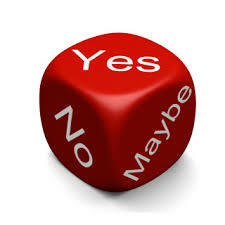 If the outcome will matter a year from now the more important being decisive is about the verdict. We make thousands of choices every day. Some as mindless as whether I want one eggs or two for breakfast, some as life altering as do I want to marry this person and spend the rest of my life with them. Being confident in your choices comes down to truly knowing yourself and choosing your own council above all others and then honouring yourself enough to stick with it.